At its May meeting the SOESD Board will honor four outstanding educators who are key to making interactive video conferencing (IVC) efforts in our region a success. Don Alexander, Superintendent/Principal of Prospect School District is Outstanding IVC Superintendent, Dennis Misner, Hidden Valley HS, Outstanding IVC Principal, Catherine Cogdill, Butte Falls, Outstanding Technology Coordinator, and Beckie Kantor, SOESD, Outstanding IVC Educator. Don Alexander, long time administrator at Prospect District 59, wears many hats; Superintendent, Principal and #1 advocate of Interactive Video Conferencing in his district. The statement “if you want something done, ask a busy person to do it” fits well in Don’s case. Don has worked with the ESD since the beginning of IVC efforts in this area and has been a hands-on leader for Prospect School District. 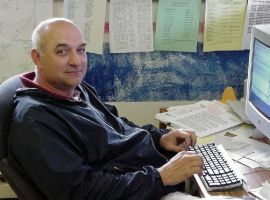 Don spent much of the first summer after the installation of the V-Tel equipment designing and crafting a customized classroom setting for the Prospect IVC room. His hard work and tireless efforts have put Prospect in a leadership position for 4-day schools that are using IVC. For all these reasons and because of his willingness to extend the vision of IVC, we choose Don Outstanding IVC Superintendent of 2005-06. 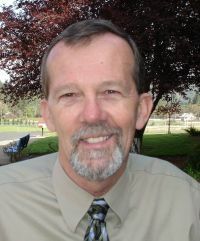 Dennis Misner is Principal of Hidden Valley High School in the Three Rivers School District of Josephine County. While Dennis’ education career has included other positions and schools, he has in recent years come back to lead the troops at Hidden Valley HS. Dennis is a hands-on type administrator. He knows his students and has worked tirelessly to meet their educational and social/emotional needs (that translates as “values” for Dennis). Principal Misner practices what he preaches: hard work and strong values are the tools that every student needs to succeed. We choose Dennis because he knows how to persevere and bring the best possible learning to his students. We are pleased that this year Dennis was able to overcome a number of obstacles (including moving the IVC room across the school) to bring Hidden Valley students Spanish III. For his vision and perseverance, we choose Dennis Misner as Outstanding IVC Principal of 2005-06. Catherine Cogdill is our Outstanding IVC Technology Coordinator for 2005-06. Catherine has been an enthusiastic advocate for IVC technology since she began working in Butte Falls in 2001. 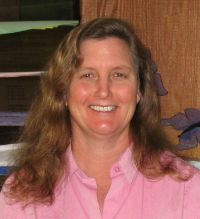 Catherine has a strong technical background and an advanced degree from San Jose State in Instructional Technology. From the first, it was obvious that Catherine caught the vision that IVC could open the doors for students and teachers to venture out into the world in a new way. As the district’s only tech support person, Catherine has encouraged Butte Falls’ teachers in all subject matters and at all grade levels to experiment with this new telecommunications device. In almost every case, when the SOESD distance learning staff needed someone to try a new event, Catherine knew a teacher who would be interested. For her contagious optimism and enthusiasm for new and innovative projects that have helped to keep IVC an ongoing option in Butte Falls District 91, we choose Catherine as Outstanding IVC Technology Coordinator of 2005-06. Four days a week, students across the state from as far away as Dayville and Monument and as close as Prospect and Butte Falls meet with SOESD’s Outstanding IVC Educator of the Year, Beckie Kantor. 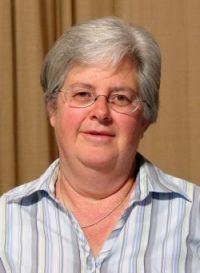 For the last three years, Beckie, an experienced Distance Learning teacher, has used IVC to teach Spanish I and II. This year she took on Spanish III students from Hidden Valley High School, and next year she will have the opportunity to teach Spanish IV at a distance. Beckie believes that after students work very hard for two years in Spanish I and II to acquire basic vocabulary and grammar skills they should have the option of third and fourth year Spanish. Beckie is a natural when it comes to building community in her classes—even across the miles. When she recently asked her students if they wanted to give up a weekend to meet face-to-face, the overwhelming majority said yes. Beckie has supplemented her IVC classes with our first efforts at blending IVC and online learning. For going the extra mile and doing it with such enthusiasm and heart, we choose Beckie as Outstanding IVC Educator of 2005-06.